slammin’ George Cook, steelhead model Michael White, steelhead savior Dave Moskowitz, spey guru Marty Sheppard, and the Utah wordsmith Robert Robinson, among others. You’ll also read pieces on October caddis, the bounce back for GTs and bones at Kiribati, a review of Johnny Cash, a detail on how to blow it or nail it on Montana’s Missouri, and where to fish on Montana’s lower Clark Fork River. As most of you know, Fly Rod & Reel died in March and I’ve filled in the gaps by joining with North 40. I’m in charge of eMags, blogs and all other editorial endeavors. 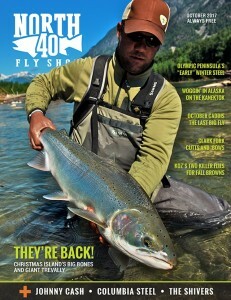 This issue of North 40 Fly is a first real stab at providing interesting content for all of you. We’ll build off this one and try to give you what you want in the future. So, check out the eMag, let us know how we did, and let us know what you want to read and see in the future. This entry was posted in Culture, Uncategorized and tagged Fly Fishing e magazine, Fly fishing the Missouri River, How to fish October caddis. Bookmark the permalink.